When Jim Yong Kim, president of the World Bank, visited Kenya earlier this month, he reportedly urged the Kenyan President Uhuru Kenyatta to sort out Kenya’s historical land injustices once and for all, specifically mentioning the plight of the “Sengwer of Cherangani Hills.” But despite the World Bank having ‘a word’ with its ‘client’, the plight of the Sengwer of Embobut forest has worsened dramatically. An indigenous community is being evicted from their ancestral land in the name of conservation. I am currently filming a documentary about the Sengwer. As I write this I am sitting in a small town on the edge of Embobut forest. On Sunday 23rd November, I was heading up into Embobut from a settlement called Tangul which sits on the edge of the contested forest area. Following my camera assistant and translator Elias Kibiwot, we had planned to film a young Sengwer woman called Ellen visiting her friend who, after having her home repeatedly burnt down by the government’s Kenyan Forest Service (KFS), is living in a tree trunk. As we walk through Tangul we notice that a crowd of Sengwer has assembled outside a few huts and tiny kiosks. Directly above them, on a hill overlooking Tangul, is the ominous KFS encampment – a constant reminder for the community that they are being watched. A distraught teenage girl stopped us, and said: “Eight people where arrested in the forest yesterday, two school childen and six elderly including my mother.” Elias spoke to them in Sengwer, and then informed me that four were released including the children after paying the KFS bribes of 500Ksh each for the children and 2000 Ksh for each elderly person. I have been back in Embobut for 12 days so far and approximately 20 people have been arrested, less then half of which have gone to court, while the rest have paid bribes to the KFS to be released. It’s hard to see how these policies conserve the forest. The woman who was beaten is called Margeret Suter. We learned that she and three others were being held at Kapsowar Police Station on the South Eastern Side of the forest. Elias and I jumped on motorbikes for a buttock clenching journey and I tried in vein to protect my seriously sunburnt nose. We stopped at least five times for the driver of my motorbike to pump up the slow puncher on his completely bald front tire. People passing paused to take photos of the Pink ‘Mzungu’ standing on the side of the road. “This is African life,” Elias told me, laughing. We arrived at Kapsowar and I followed Elias into the police station, filming with my small and discreet Go Pro camera, as the three Sengwer men and one woman were brought out from a large metal door. As Margeret was led out of the cell, I realized I had filmed her on my previous visit to the forest. The left side of her face was visibly swollen. It was clear to me that she has been punched in the face, a face that I have looked at on my computer since August. “I told them but they didn’t listen,” she said. At this point, I chimed in and explained that she could have concussion and should therefore see a doctor before spending another night in a police cell. My concerns fell on deaf ears as we were asked to leave the police station. The next morning we took another buttock bashing ride in a ‘Matatu’ to the town of Iten, home of Kenyan champion marathon runners and the Elgeiyo Marakwet County Court. We watched the four Sengwer being led from the back of a police van and into the courtroom. It’s another 6 hours until the case is actually heard. The Sengwer were called one by one into the dock and asked how they plead. The prosecutor explained that they are “charged with illegally being in Embobut Forest which is state property.” The judge asked each one of them how they plead. The Sengwer lawyer tried to speak, but was silenced by the judge, who told him to let the defendants speak for themselves. Three of the Sengwer pleaded guilty, including Margeret, who begged for mercy to be released so she could return to take care of her children. A forth man, Kereoi Lobela, defiantly pleaded not guilty: “I’m a Sengwer and I was in my ancestral.” Kereoi was released on cash bail of 3000Ksh and must return to court to hear his case on 8th December. The other three were sentenced to community service. As I write this Margeret is probably scrubbing the floors of an Iten courtroom. But the KFS is doing more than just burning homes and arresting people. They are also dividing the community. They have been recruiting and paying ‘forest scouts’, local Sengwers who have been named ‘sell-outs’ by the local community. They are using these forest scouts to find displaced Sengwers living in tree trunks and hideaways that the KFS have trouble locating. But on 10th June 2011, the project was restructured and the development objective was redefined to “improve the management of water and forest resources in selected districts.” Approved by the World Bank, this amendment completely removed the modest protection afforded to the Sengwers under the project. 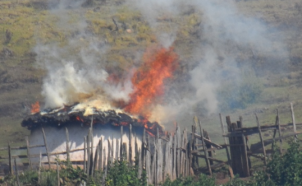 The programme led to forcible evictions of the Sengwer as over 1,000 homes were torched and they were forced to flee their homes, driven out by the KFS. In 2013 a request for an investigation was made by representatives of the Sengwer to the World Bank’s Inspection Panel – the body responsible for overseeing grievances filed against the Bank. In October they issued a report stating that although the World Bank had not followed some if its safeguards, it was not responsible for the evictions of the Sengwer. This, despite the Bank funding the KFS to the tune of around $64 million dollars between 2007 and 2013, came in a period in which evictions took place every year except 2012. The situation the Sengwer find themselves in is also linked to a UN initiative called REDD (Reducing Emissions from Deforestation and Forest Degradation), which “is an effort to create a financial value for the carbon stored in forests, offering incentives for developing countries to reduce emissions from forested lands and invest in low-carbon paths to sustainable development.” However Friends of the Earth is concerned that REDD could “foster an ‘armed protection’ mentality that could lead to the displacement of millions of forest-dependent people.” This seems well-founded in the case of the Sengwer. My attempts to get an interview or a response from the KFS have so far failed, and it’s not looking too likely that they will agree to talk to me. I will hopefully get a chance to interview a representative of the World Bank, and I will ask them how they feel about the current actions of their former client. I can’t help but wonder if the boots that kicked Margeret Suter in the back on Saturday morning were bought with World Bank money that only finished flowing at the end of last year. It seems like a shame that the World Bank funding was not used to educate, involve and engage the Sengwer in a community-led conservation initiative instead of being used to evict them and buy new weapons. My friends live in Kenya, although not in the Cherangani Hills or nearby. I think presidents that come in power, mostly get overwhelmed and fail to serve the real rights of people.